The Egypt 3 slot is the third and best of at least 5 canyons of varying depth and narrowness that cut into the southeast side of the Egypt Bench, a plateau with sand dunes and other rock formations thought by early explorers to resemble the land of the pharaohs. 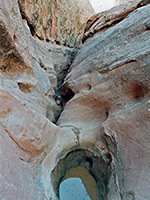 The drainage has three distinct parts - after a dramatic 120 foot dryfall it starts with a succession of descending, inter-linked potholes through smooth red rocks, has a long and extremely narrow, intricately-textured middle section then ends with a short technical stretch with several sheer drops into pools that require rappelling and maybe swimming. 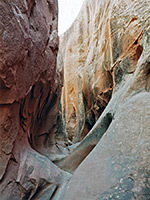 Overall it is one of the finest slot canyons in the Escalante region. Mile 17 of the Hole-in-the-Rock road marks the turn-off for the canyon - from here a signed 10 mile track heads east and a little north, ending at the main trailhead for hikes into the middle Escalante River region; as well as the river, popular canyons nearby reachable on day trips include Fence, Neon, Choprock and lower Twentyfive Mile Wash. The first half of this side road is heavily graded but otherwise untroublesome, then it crosses Twentyfive Mile Wash - a potential problem after recent wet weather, and later passes over 2 smaller washes and the tops of two canyons by which time the surface has deteriorated. Some parts are over several meters of slickrock, and regular cars have to be driven quite carefully. Egypt 3 starts as a shallow streamway on the south side about half a mile before the road forks, at which a sign states 'Egypt 1' to the right and 'Allen Dump' to the left, and is recognisable by the large number of tyre marks and footprints at roadside. 10 views of Egypt 3. TopoQuest topographic map of Egypt 3 (the drainage east of 5471T). It is a just short walk from the small parking area at the side of the approach road down a shallow gully to the sudden vertical drop off at the head of the canyon, where Egypt 3 plunges 120 feet as it enters the Navajo sandstone layer. Beneath the dryfall are a few deep pools and a short stretch of narrows; the main canyon starts a little further on, after an open area reached by walking along the rim to the left and descending a steep slope to the canyon floor. Downstream of this access point, the streambed is soon quite enclosed and begins to descend steadily - short level passages are mixed with numerous inter-connected potholes some of which require climbing and/or sliding down drops of several meters. 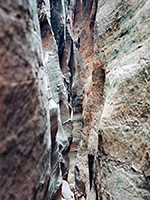 Parts are quite dark with blackish, overhanging cliffs at either side but mostly the rocks are smooth and red, and the walls although generally angled away from vertical are consistently high and offer no escape routes. In wet weather the potholes may have pools of up to 3 feet deep, and all of this section requires care and effort, especially if returning upstream. The greatest obstacle is one pothole that is just too deep, wide and with sheer sides that the only way past is to drop in the water (if present) then climb back out, and this may not be possible for one person. Not far beyond this problematic spot, the upper narrows end and there is an entry/exit point up a low side canyon that joins from the northeast. The only aspect spoiling the upper narrows is the amount of black shoe leather marks left by people sliding down between the potholes but perhaps these will be washed away each time the canyon floods. 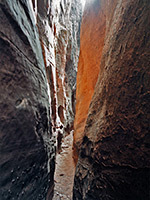 Next, the canyon takes on quite a different character as it enters half a mile of straight but extremely narrow passageways, in places only 8 inches wide. Many people simply won't fit through here, certainly not with large backpacks. 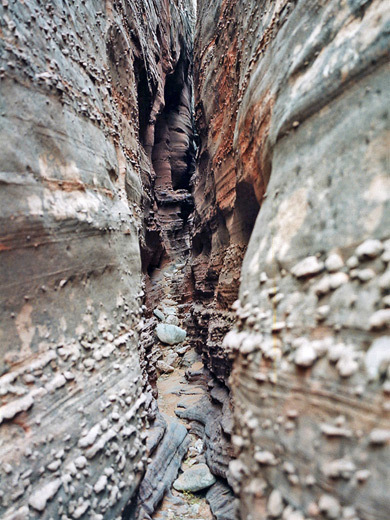 The walls are dark in color and have exposed layers of embedded pebbles, creating a rather eerie atmosphere, similar to parts of Brimstone Gulch. Apart from the narrowness, this section has no obstructions - the floor is flat and sandy, or just bare rock, and there are no dryfalls. Eventually the canyon relents and for another half mile or so is quite open and shallow, with many places to climb out. Near the end, approaching the junction with Twentyfive Mile Wash and just before the smaller Egypt 2 canyon joins from the west it deepens again, passes 3 little natural bridges, drops 10 feet into a pothole then has a much higher drop into a deep passage - ropes are needed to continue, although not far ahead the narrows end quite abruptly after a permanently flooded section that may need swimming. From the Egypt Bench road to the natural bridges is just over 4 miles, which takes about 2 hours if hiked quickly. An alternative to returning up the canyon is to climb the ridge between it and the Egypt 4 drainage to the east, then follow this back to the road - a nice walk over sandstone mounds with far reaching views over the rocky land all around.